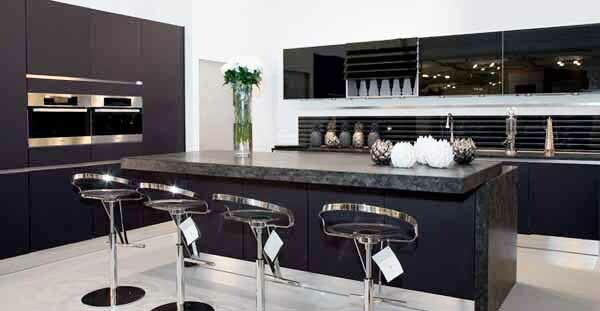 Contemporary kitchen design trends 2013 are influenced by modern interior design trends, bringing natural wood and new materials, exciting textures and unusual design elements into spacious, elegant, multifunctional and impressive kitchen interiors. Contemporary kitchen cabinets, decorated with innovative and beautiful fabrics that mimic animal skins, glass surfaces with LED lighting, attractive lighting sets for dining and working areas, mini computers, sensors and tactile switches, incorporated into kitchen cabinets doors, make contemporary kitchen design more comfortable and attractive. Here are 8 contemporary kitchen design trends for 2013, that highlight the latest, innovative and interesting kitchen cabinets and kitchen islands design ideas for creating stylish and modern kitchen interiors for contemporary homes. 1. 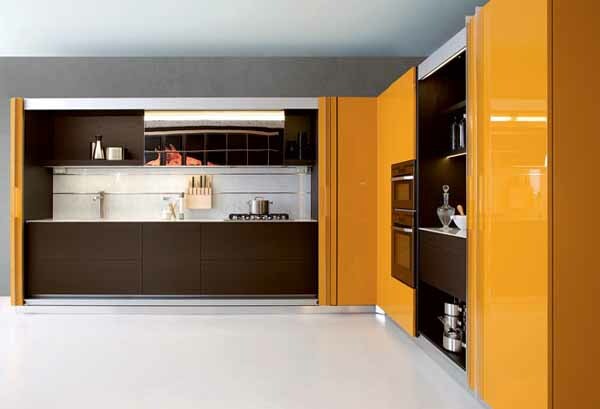 Contemporary kitchen cabinets with folding doors, that can hide storage shelves or kitchen appliances, are space saving, elegant and functional modern kitchen design trends 2013 that add bold colors, stylish chic and contemporary flavor to modern kitchen interiors. 2. Kitchen hoods, that are not only functional and efficient, but very decorative, are one of new modern kitchen trends for 2013. 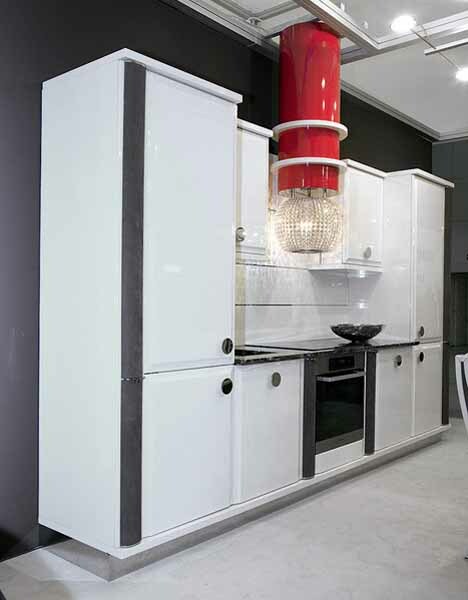 A kitchen hood, combined with a crystal chandelier, combined with gloosy kitchen cabinets and light interior decorating colors make modern kitchen designs feel bright and luxurious. 3. Contemporary kitchen cabinets with recessed handles and drawers that easy open by a slight touch create simple, clean, easy to use, safe and elegant kitchen design for modern homes and apartments. 4. 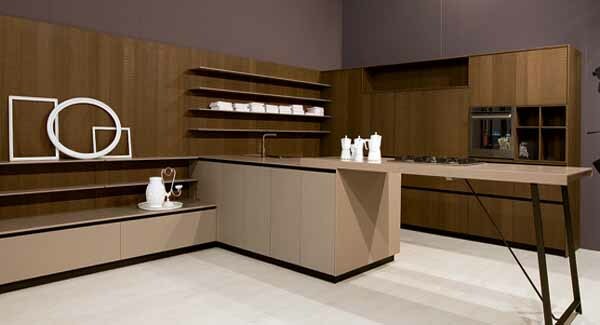 Contemporary kitchen cabinets made of innovative wood materials and aluminum frames features durable, but thin and light panels and doors. 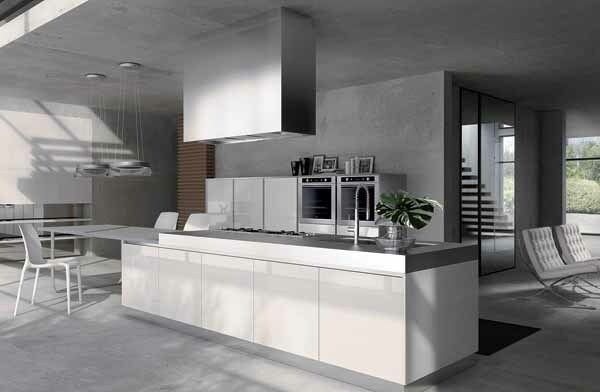 Contemporary wooden materials, tempered glass with incorporated LED lights, marble and natural stone are modern kitchen design trends 2013 for countertops and kitchen islands. 5. Contemporary kitchen cabinets in minimalist style with extending working and dining surfaces are one of modern kitchen design trends 2013 for those who appresiate the simplicity and functionality, man made materials and glossy surfaces, spacious kitchen interior decor and light colors, like off-whites and gray. 6. 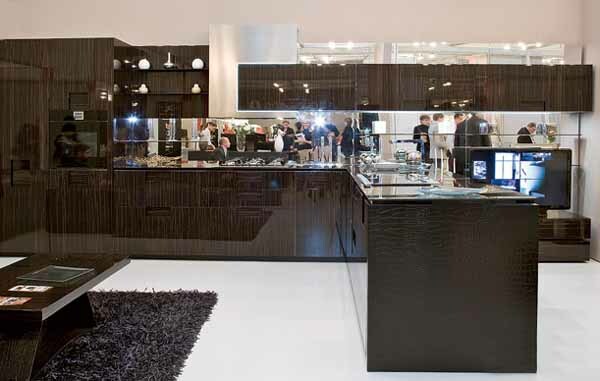 Contemporary kitchen cabinets that made of luxurious fabrics, that mimic animal skin, and exotic woods are modern kitchen design trends for those who like unusual and impressive design ideas, elegant dark colors and dynamic contrasts. 7. Dark wooden colors create strong contrasts with white kitchen decor. 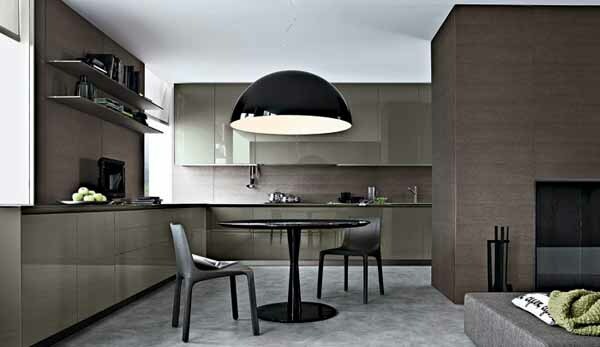 Decorative wall panels and open shelves make contemporary kitchen design look more interesting and informal. Unusual large kitchen peninsula designs that feature a cooking top and a dining surface are supported by weightless frames that create spacious contemporary kitchen interiors. 8. Sliding kitchen island surfaces, extending working and dining surfaces, and hanging on the wall upper cabinets with tectile switches and automatic opening and closing mechanisms make modern kitchen interiors more comfortable and functional. 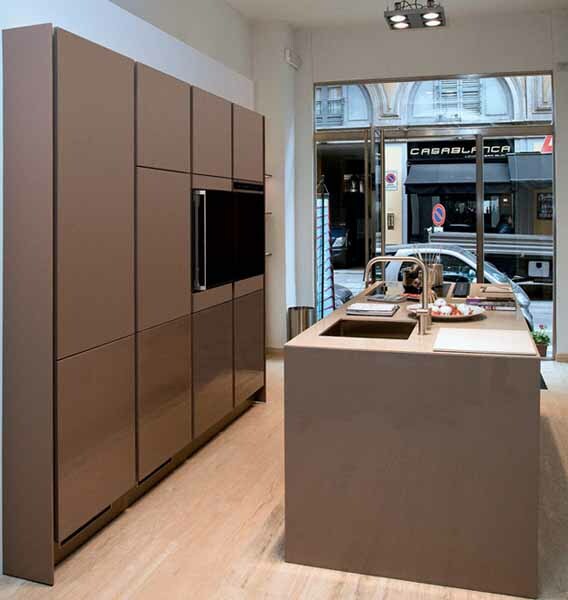 Mini computers and touch sensors, built into cabinets doors and reacting to a light touch, are kitchen design trends that in 2013 will add a futuristic feel to modern homes.